Think stopped making the City electric minicar in Finland in March. The company filed for bankruptcy June 22. Turkey-based investment group BD Otomotive says it is in advanced negotiations to rescue tiny electric car maker Think Global AS from collapse. "Our intentions are simple – to bring Think out of bankruptcy and make it the affordable urban EV for Europe it was always designed to be," BD Otomotive Chairman Osman Boyner said in a statement. "We have the manufacturing capabilities and sales network to do this, and combined with a core group of retained Think talent in Norway, we aim to launch new platforms and the next generation of vehicles if successful in our bid." BD Otomotive has completed its due diligence on the deal and has approval from its board to complete the transaction, the statement said. Think filed for bankruptcy June 22 after attempts to keep the company going through recapitalization and restructuring failed. It is the fourth time Think has collapsed financially in its 20-year history. A court-appointed trustee from Oslo-based commercial law firm Thommessen has control of Think and is handling negations with BD Otomotive. According to the statement, BD Otomotive owns and operates production facilities in Turkey and Italy that help convert fuel-powered light commercial vehicles into electric vehicles (EVs). It also assembles automotive battery packs and has a recycling plant for lithium ion and other industrial batteries. In addition, the group has invested in EV charging infrastructure, owns and operates charging stations across Turkey and is a distributor of Fisker Automotive's plug-in hybrids. 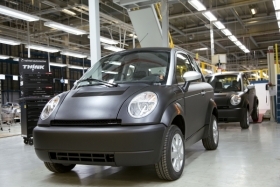 European production of the carmaker's lone model, the City minicar, stopped in March. At the time, the company said it halted the assembly line at contract manufacturer and Think investor Valmet Automotive's factory in Uusikaupunki, Finland, to re-balance its inventory. Think sold just 1,043 units of the City in 2010. The trustee has responsibility for managing all the company's assets, including wholly owned U.S. subsidiary Think North America, which has an EV production plant in Elkhart, Indiana. In 2008, the global financial downturn nearly killed Think, but the company found new investors and restarted production in late 2009. Think was owned by Ford Motor Co. from mid-1999 until January 2003 and has struggled since the U.S. automaker's departure.